Life has been a series of unexpected twists and turns for this dancer-turned-choreographer and dance instructor. While some people learn to dance, Akila Palipana, it seems, was born to dance. He instinctively moves to the beat, letting the song guide his hands and feet into a series of expressions emerging from within himself. His flair and passion for the art has made the 29 year old into one of the country’s most sought after choreographers in on stage, on TV and now stage plays too, all in a relatively short period of time. His most recent venture was choreographing a play directed by Namel Weeramuni and penned by Weeramuni and Professor J B Disanayaka. Titled ‘Ravana Seethabilashaya’ the play went on board the Punchi Theater last month. “A good dancer needs to grasp whatever a choreographer tells him or her in an instance. Be it about the timing, expressions or body language, the dancer should realize what the choreographer expects of him or her. This is one of the greatest hurdles that a dancer needs to overcome during each and every performance. He or she also needs a lot of control to hold an action or expression intact,” Akila opined adding that being able to jump or twirl well alone will not make one an exceptional dancer. Akila’s first big break came when he clinched the Best Creative Dancer award at Kavitha Talent Show 2013. The event saw university students from across the country taking to the stage to unleash their talents in a variety of fields like dancing, literature, stage drama, music, art, still photography etc. The event was organized by the Sports and Talents Development Division of the Higher Education Ministry. Akila had choreographed all the eight dance items he presented for the event. 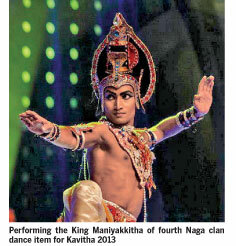 He presented a dance portraying King Maniakkitha of the Naga clan at the finals. The following year he choreographed and presented a group dance which won the award for the Best Folk dance. The team presented a lotus dance at the finals. “I did a lot of research before choreographing the lotus dance. We had to compose dance items using the Kandyan, Southern and Sabaragamuwa dance styles for the event. I also choreographed another dance item for female dancers based on the concept of finger millet. That won third place at the event,” he expressed. Later at the awards ceremony Professor Ariyaratne Kaluarachchi invited him to choreograph a dance production by engaging the students of the dance teams which won first, second and third place. Kulasiri Budawatta’s wife coordinated the project. He had choreographed a dance based on cashew for them. Recalling how he got into the art, Akila says he and his siblings and their friends used to frequent a dance class which was held near their home. Back at home he would imitate the movements of the dancers he had seen training in the class. Noting his flair for dancing Akila’s parents decided to send him for classes with his brother and peers. Though the rest of the group dropped out Akila continued taking part in the classes which were conducted by a teacher named Nilmini. He was in grade three then. At Madamulla de Mel Navodya School he was trained by Senadeera. Later he came under the guidance of Wijesooriya. After finishing his G C E Ordinary Level examination he joined Ibbagamuwa Madya Maha Vidyalaya. He was trained by three teachers there and he managed to top the all island dance competitions for two consecutive years. He also learnt Kathak dancing under Duleeka Wickramasinghe for around four years. 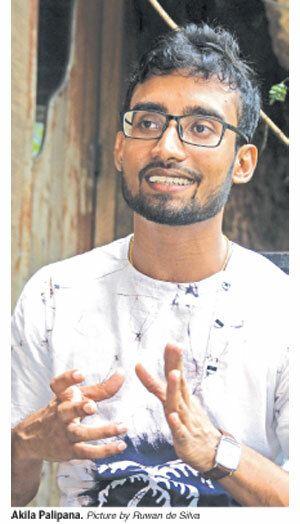 Though he has mastered Kandyan dancing Akila first learnt Southern and Sabaragamuwa dancing from his dance guru, Padmini, while he was studying at Kelaniya University. He was also guided by several other experts in dance at the university including Professor Mudiyanse Dissanayake. Akila has completed his BA in Fine Arts in 2013. He also did his Masters in the subject. He followed the choreography diploma at the Foundation Institute. Around 30 people followed the course and five were selected to make a production at the end of the event. Akila was among the selected five. He was the youngest in the group. The team made a production based on emotions and Akila had to choreograph an item based on sadness. His choreography which was a fusion of Kathak and Kandyan dancing was appreciated by many. “All these experiences helped me enhance my skills. Each and every one of my gurus have inspired me in my productions,” he said adding that he also admires India’s lionized classical dance company Nrityagram’s work. 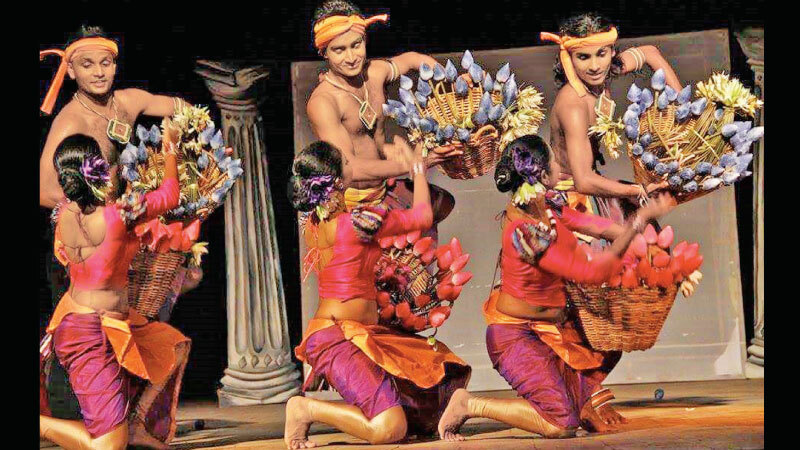 “They did a production titled ‘Samhara’ with the Chitrasena dancers. Their movements are quite natural and they are very dedicated to the art,” he noted. During Kavitha 2014 Akila encountered Nuwan Ranjith Priyanga who was attached to the Chitrasena Dance Ensemble. He encouraged him to join the Chitrasena dance team. Akila still holds the record of being the dancer who had made it to their dance troupe in the shortest span. Two months after joining in he was chosen to be one of the three dancers in the Ganapathi Wannama which was choreographed Heshma Wignaraja based on a work by originally choreographed by Vajira Chitrasena. He has taken part in many projects spearheaded by the Chitrasena Dance Ensemble. He even choreographed the children’s dance items titled Polpithi Haraka and Eluwan Keema which were part of The Guru Gedara Festival. “All the seniors in the Chitrasena Dance Ensemble gave valuable advice which came in handy when I choreographed the dance items,” he said. Akila has gotten many offers to teach dancing at schools but he does not believe in teaching the theory based subject. He believes that as an individual he has the scope to do more to enrich the local dance scene. He holds a dance session once per week in his home town. He is also a university visiting lecturer. Speaking about the dance styles he had mastered he noted that going in depth in any dance style is challenging. “There are so many things to learn. The movements are all interconnected. One person may be able to master one movement while another who is a more senior dancer might not be able to manage the movement as well as his or her partner,” Akila mused adding that his ambition is to excel in the field as a dancer and choreographer. “Make wishes. Do not chase after trends. I believe in the power of the mind so if you are really determined about a certain aspect, an opportunity will open up for you,” he advised.